Ever tried to rip out an invisible appliqué stitch (No 51 on the Janome 7700) made with clear monofilament thread? In not, don’t. It is was close to sewing hell as you can get. But I managed to get out like ten of the stars and could start over again, this time with a very narrow zig-zack which is way more easy to rip out if in need. So yesterday I finished the second part of the stars an only now when I view the pic I see that one part has less stars that the other. 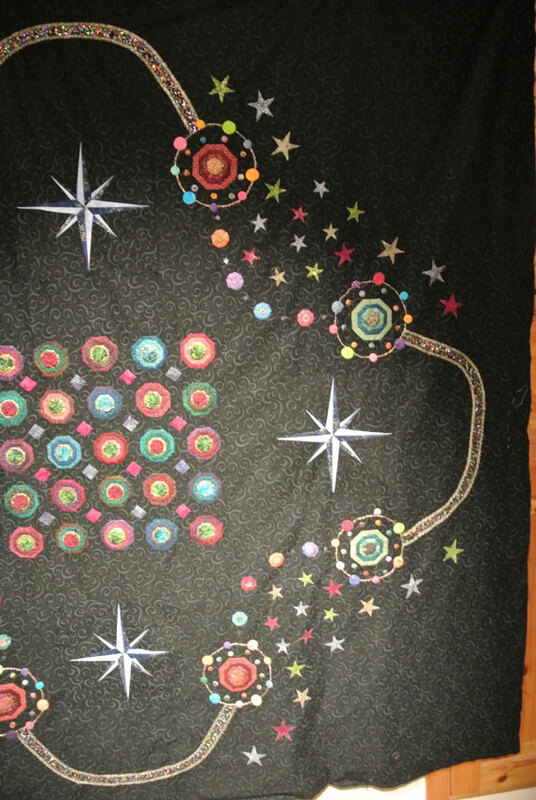 Well – h-k if I’m going to rip out all these stars…I have decided to call it creative independence along with the tiny fraying along the edges of the stars, which seem unavoidable no matter what fusable I use. Truly think it has something with the sizes of the start and the sharp angles. Well this is what it look so far, as most of the times not the best picture. Believe it or not but in this quite large house, there is no free walls to hold a top – except for the boiler room ;o And the lighting is good in there too, so I might try to tape it to the wall when the third alignment is done. Have a lovely Friday. Here it’s some minus C degrees and lot’s of snow and there is a sprinkle of more in the air. I don’t think you will have to worry about anyone counting the number of stars in each area….. have you considered making a few… out in the distance… sort of sprinkled about? Yes I have but have not managed to make them to work. Yet….